When will you announce the Dare Challenge winners? Winners will be announced on April 15th! What is the Dare Challenge prize? Who can enter the Dare Challenge? Anyone can enter, but only Daring Contest backers will be eligible to win at the end of the project! How do I win the Dare Challenge? Winners will be chosen at random! May the odds be ever in your favor! How do I know if I was entered in the Dare Challenge? If we liked your post from the Daring Contest Facebook page, it means we’ve seen your post and have entered you into the drawing! However, in a few cases, Facebook hasn’t allowed us to like posts, and in a few other cases, Facebook hasn’t tagged us to even see them. We think the problem may be caused by adding other text to your status, which for some reason seems to sabotage the Daring Contest page tagging process. So be sure to copy and paste the Dare Challenge phrase exactly how we have it, and we will see if this problem goes away! How will add-ons work? Where do I go to order them? We're handling add-ons through BackerKit! Two weeks after the campaign ends, we will send out a BackerKit survey where you'll be able to specify shipping info and tell us which add-ons you want. The cards are standard poker-size cards. Are the campaign rewards EU friendly? Yes, Daring Contest is an EU friendly campaign! Are there going to be more expansions? For now, the only planned expansions are the Drinking Game Expansion Pack, Modifier Expansion Pack, and the Penalty Expansion Pack. How many players was this game designed for? 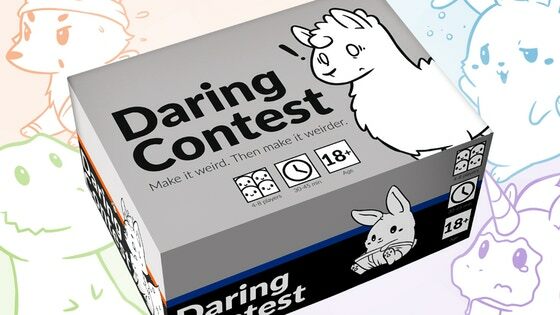 We designed Daring Contest to be played with 4-8 players. When will you announce the Dare Challenge winners? What is the Dare Challenge prize? Who can enter the Dare Challenge? How do I win the Dare Challenge? How do I know if I was entered in the Dare Challenge? How will add-ons work? Where do I go to order them? What size are the cards? Are the campaign rewards EU friendly? Are there going to be more expansions? What countries do you ship to? How many players was this game designed for? I want to know when my reward is shipping. I am having trouble filling out my survey. I would like to make a change to my pledge. I would like help with preorders. I have a issue with my pledge finances. I have a question for the project creator. I have a question not listed here. I want a refund for my initial campaign pledge. I have a question about BackerKit.